We woke up at Maike’s parent’s place at Katzem. 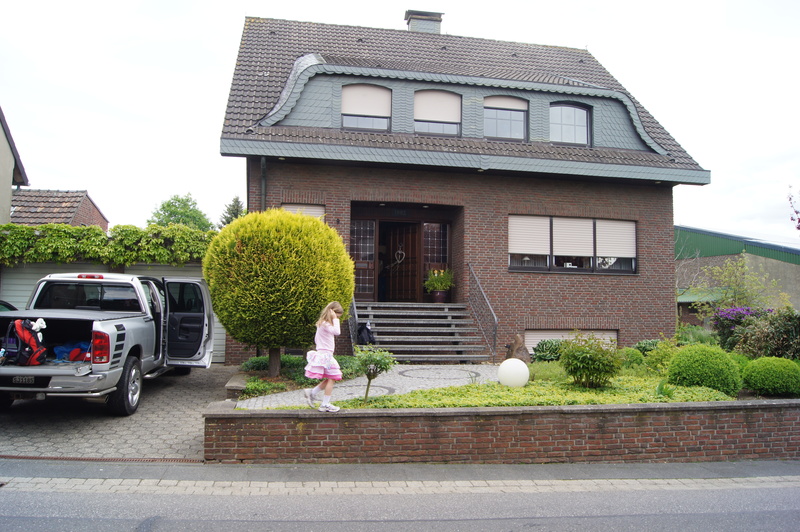 It was very interesting to see Katzen and Maike’s parent’s house. Katzen is a village of about 1000 people. The house was very large and was 4 levels including a basement that was the size of a nice two bedroom apartment. We all slept a superb nights sleep. I think Di was the first up at about 10am and Matthew the last at midday. Maike’s mum Elizabeth rolled out a magnificent breakfast feast of breads, cheeses, fruits, meats and a few edible flowers for good measure. After pigging out for an hour we met Stephan, Maike’s brother and toured their garden. 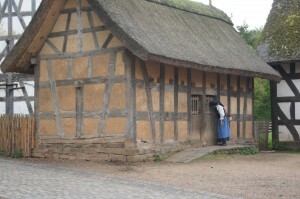 It was a fantastic experience being in a German village with some locals. 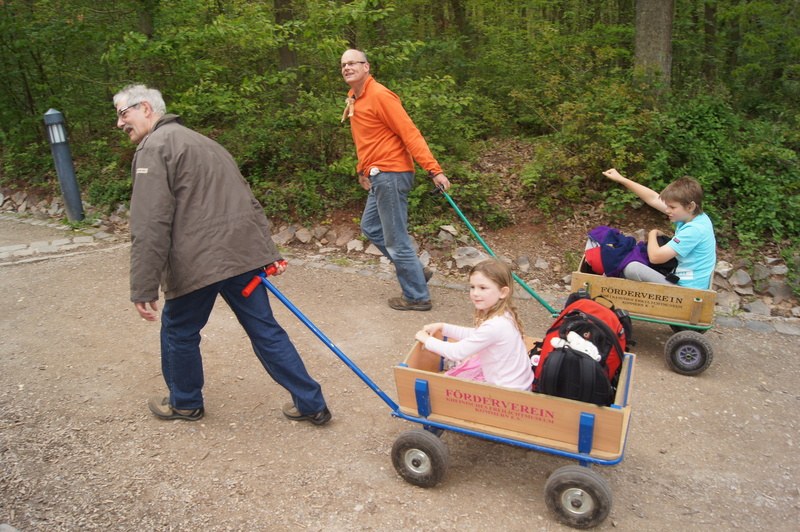 After a very leisurely morning we eventually left Katzem an headed for Kommern at about 2pm. We got a bit lost getting to Kommern which was good because we drove through a winery area which was quite beautiful. 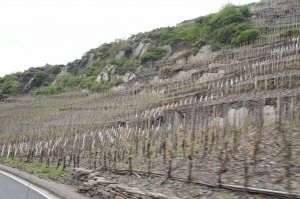 The vines were growing on very steep hills which had been terraced out of stone. I suspect that if it was Australia the land would have been written off as useless. We eventually resorted to using the GPS in Di’s iPhone to find Kommern and arrived there just after 4pm. Kommern is a bit like old Sydney Town on steroids. It have five or six deferent old German villages on site constructed of buildings bought from other places around Germany. When we arrived Joseph appeared from around the corner wheeling a 4 wheeled wooden cart. These carts are designed for carrying children and bags so the children do not have to walk around the villages. As soon as Matthew realized that Sophie was going to be lulled around in a cart he said he wanted to be pulled around as well.generously Joseph hired another cart and ended up pulling Matthew around the village for a couple of hours. The village was very interesting most of the buildings seem to date from around the late 1600s which is about the time that Europeans “discovered” Australia. They had barns for the animals as well and had chickens, goats, cows and pigs on-site. Having arrived at 4pm on a weekday we pretty much had the place to ourselves and we spent time admiring the old houses and the kids reveled in being pulled around. We eventually left a few minutes after the place closed at 6.45am. 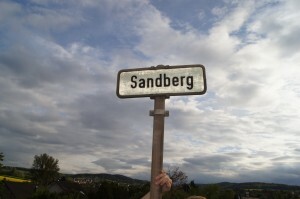 On the way to Kommern we had seen a street or village sign “Sandberg”, which is Di’s maiden name. 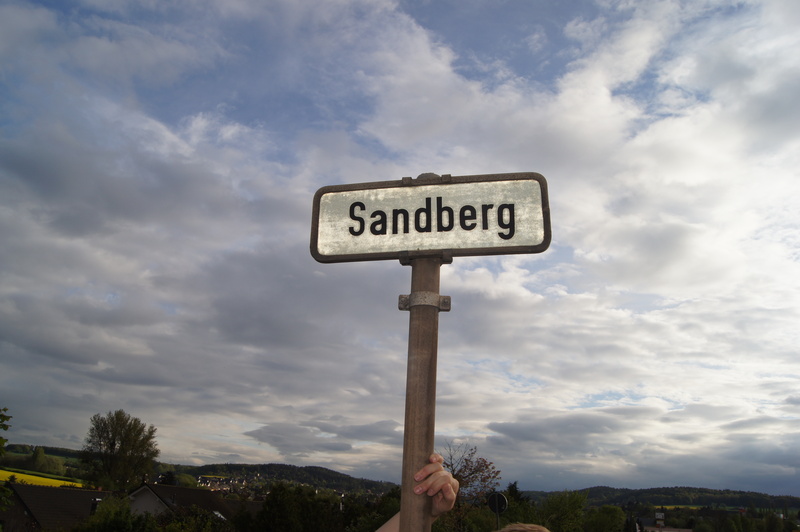 Sandberg is a very rare name in Australia so we stopped to get a photos of Di under the sign. We the. 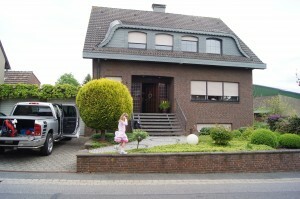 Drove back to Koln, where Maike and Lucas greeted us with a dinner of Spaghetti bolognaise which is the kids favourite. We then stayed up too late talking. The kids will be feral tomorrow.